Domestic flying in Japan is like modern flying with all the perks of circa 1980. It is convenience to the highest degree. This is going to blow your mind and may sound a little unbelievable but I promise you it is all true. We get to the airport the standard one hour before the flight and headed to the check in desk. Devin pulled out our confirmation e-mail and handed it to the lady at the counter. She then promptly took our bags and checked them in for us free of charge, then handed us back our confirmation e-mail along with a small receipt-sized ticket that indicated our gate and seat number. Notice anything missing? They never asked for our IDs. I mean that quite literally. 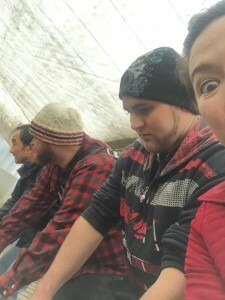 The entire time there was no TSA-type checking to see if we had our IDs on us and at no point in time did they question whether or not we were the people we said we were who was boarding the plane we said we were scheduled to take. Then we had to go through security. Shoes? Keep ‘em on, don’t worry about it! Liquids, gels or aerosols? No problem, they can stay in your bags! Shawn had with him a large open bag filled with bottles of bourbon that he was giving to the breeders we were visiting as gifts which he couldn’t check in. What did security say? No problem, we’ll just scan it twice then you’re good to go. On top of that, there wasn’t one or two security lines open: there were around ten lines open which made going through security take no time at all. In a matter of fifteen minutes we were checked in, through security and ready to go. Everything went so quick that we even had time to have ramen at the gate restaurant! After an hour and a half of flying time, we arrived in Hiroshima then proceeded to pick up our rental car. 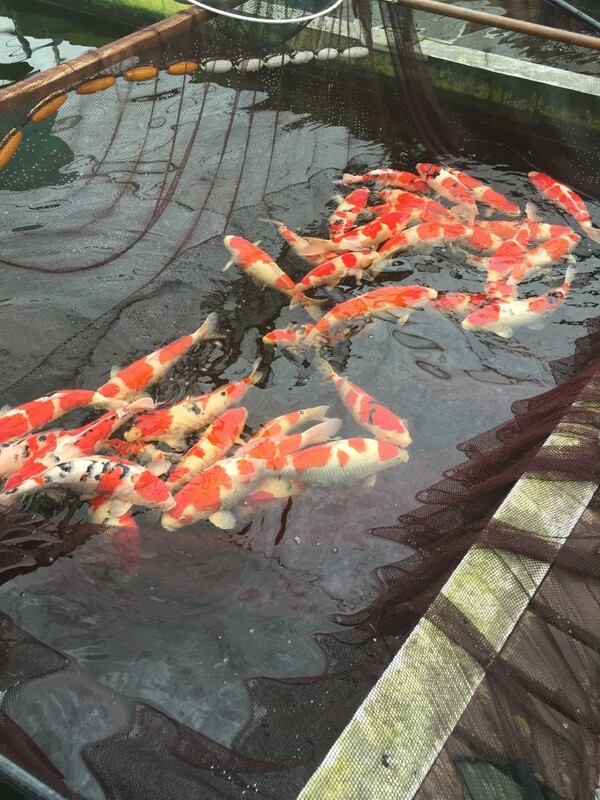 Sakai fish farm is in MIhara city, which is about a 20 minute drive from the Hiroshima airport. When we got to Sakai fish farm, Kentaro Sakai san arrived to greet us in the coolest little yellow single-seater kei-truck type vehicle. We arrived just before lunch so Kentaro took us for a meal first before showing us around. 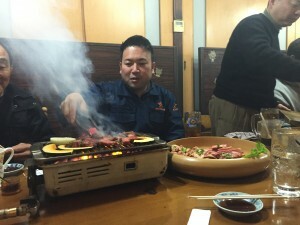 The first time I was in Hiroshima, I was with my dad and Tito Kenji and we were fed the most amazing, melts-in-your-mouth, high quality yakiniku (barbequed beef) and I have yet to eat anything that can rival that level. You literally don’t have to chew it. As we pulled up to the restaurant, my heart skipped a beat when I realized where we were. Topped of by the fact that Kentaro Sakai himself is cooking your meal for you? Heaven. After lunch, we head back to the farm and proceed to check out the fish. Sakai fish farm is truly an amazing place. 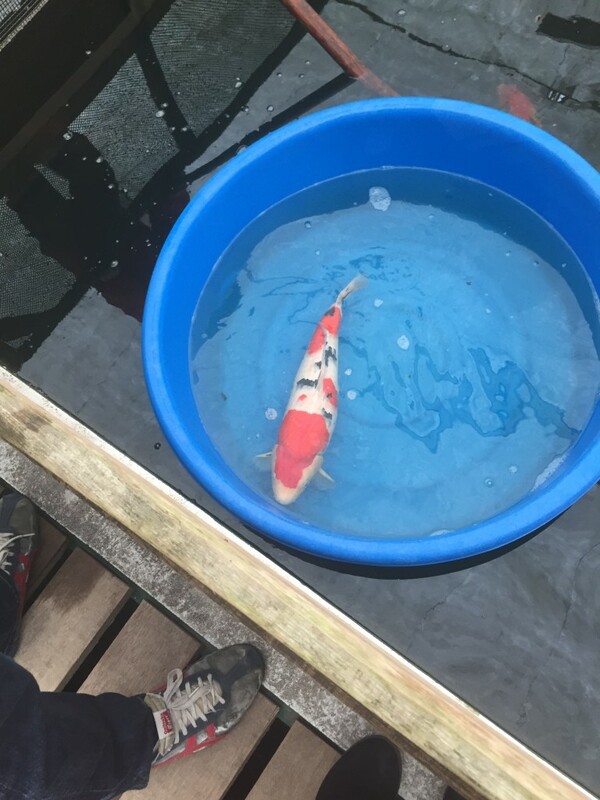 Spanning over 120 years in total for fish farming and 60 years doing Nishikigoi, they have four generations of experience in breeding some of the highest quality Koi you can find. One day is not even close to see everything that Sakai Fish Farm has to offer, but even just one greenhouse is enough to blow your mind. 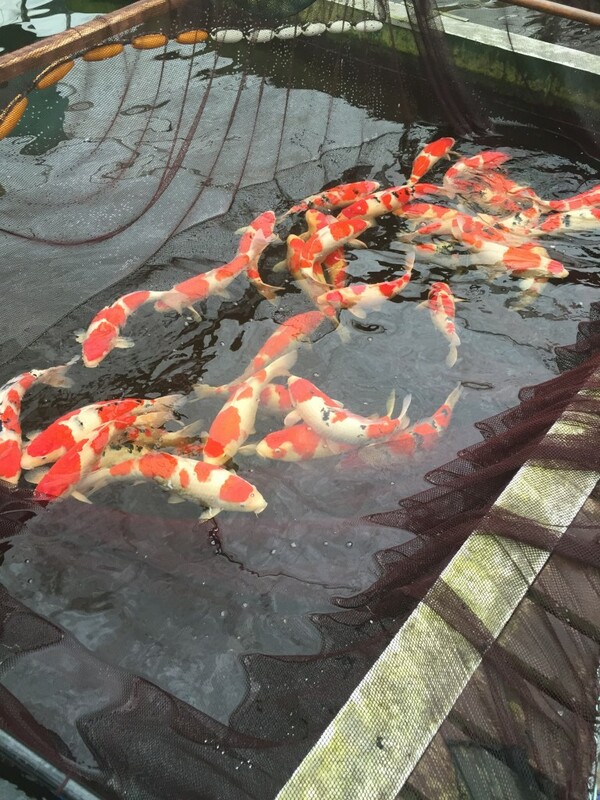 Sakai Fish Farm has been known to produce some of the best Kohaku and Sanke, which means there was a lot of beni to admire. 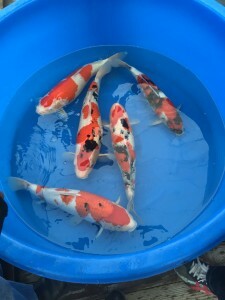 While we were looking at Koi, the topic of beni styles came up in the conversation. There were several fish in one tank alone that featured different “kinds” of beni and it was interesting to see what we all had to say about it. 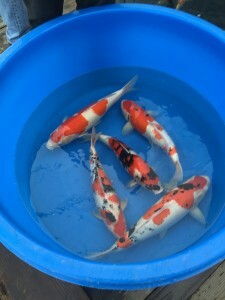 The speed of which the Koi industry has been developing is something that can only be described as both fast and slow. To be able to develop, sustain, stabilize and replicate a certain aspect of an oyagoi that you would like to maintain takes more than one spawning to achieve. However in my lifetime alone, I have seen quite the dramatic evolution of Koi’s beni. In the past it was desireable in Koi to have the persimmon shade of beni rather than the hard beni for two main reasons: this shade of beni had a better chance of holding it’s color rich and tight as it matures and having that shade of beni give the Koi a better chance of being female. 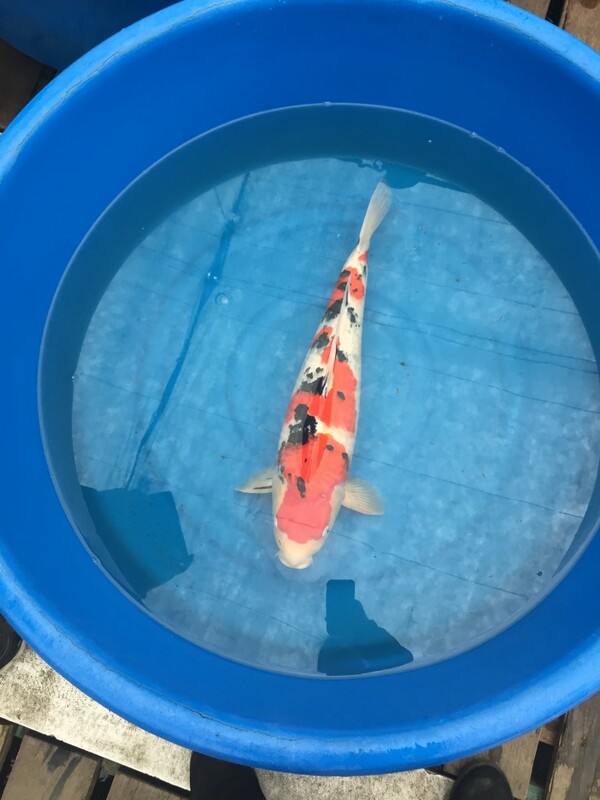 In recent years, however, the deeper, richer, red beni has slowly become not only more stable but also more prominent in Koi being produced. It is no longer something to be approached with trepidation, and now allows itself to be desired and admired for those who prefer this shade of hi. With this new development comes new options and new trends to look out for. It opens your mind to possibilities and how that can be translated into reality. This evolution is the reason why I not only enjoy coming to Japan often, but also feel that it is something necessary. It allows you to be in the heart of breaking developments in Koi and builds on your existing knowledge. It is an ever-changing and evolving industry that constantly pushes itself further and further to see how much can be achieved. At the end of our discussion, Shawn, Devin and I came to the conclusion that it really all boils down to personal preference. Whether you like the crimson beni or the persimmon beni matters a lot less than the quality it’s hi. When looking at beni, it’s more important to understand depth, richness and even-ness of it’s color. So, what kind of beni do you prefer? Devin was up first to pick his choice of Koi and he bowled this lovely Sanke that is set to come home to Minnesota very soon. I wasn’t able to get a very good image of the Koi by itself, but I did manage to get a video! After we were done with our selections, Kentaro asked if we were interested in seeing another farm about ten minutes away. Of course we would! 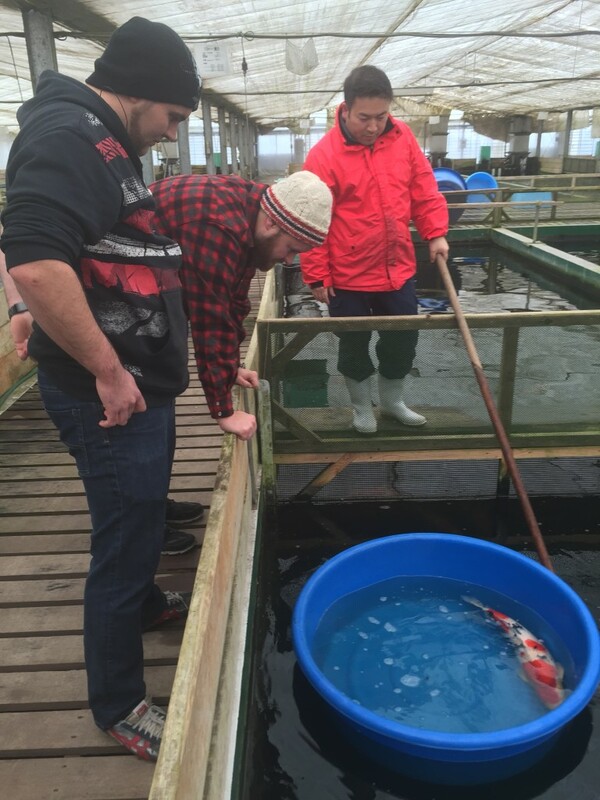 Kentaro took us to see Tamaura Koi farm, which is somewhere I hadn’t been to before. When we arrived, I thought the sacho looked familiar to me, and apparently he had felt the same way too. 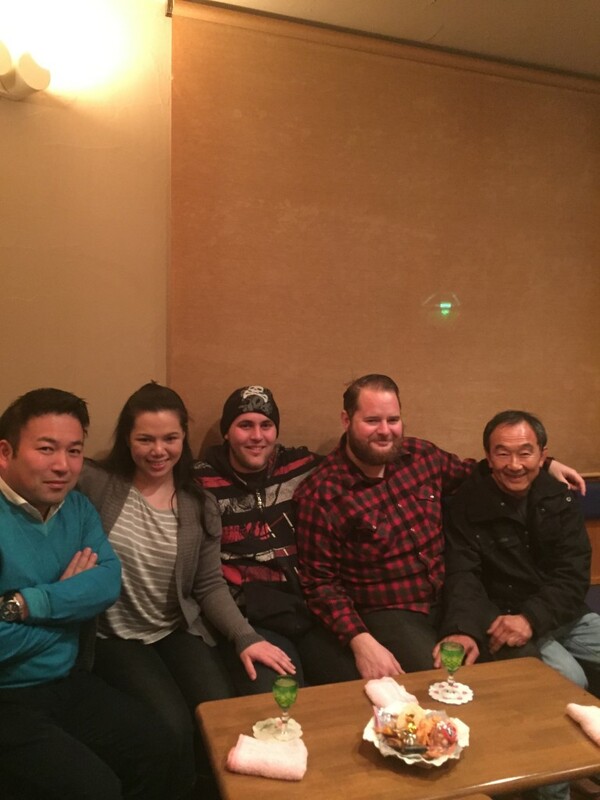 Kentaro explained that I would normally be with Kenji Tani and that I was the daughter of Mike Hernandez but now I’m with my husband Devin Swanson. Looks like I got some greenhouse-cred! lol. We looked at some fish and bowled a few of them.